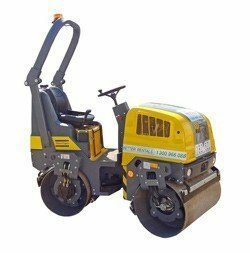 Why hire a roller from us? We recommend the right roller – not the most expensive. On Time Delivery – Guaranteed. If it’s late – delivery is free. All Inclusive roller hire rates here on the website. No added extras – ever. What we include in the hire rate…. GST and Damage waiver (subject to reasonable conditions). And the reasonable conditions in the case of our roller hire fleet is we charge for all damage to the water system. A roller you hire form us is NOT designed to roll mud. Mud collects on the drums and eventually tears off the water system. Free Trailer: A free trailer is provided in the roller hire rate of the 1.2 tonne roller. You’re driving to site anyway so you may as well take the roller with you. Reliability: Our roller fleet is all low hour and well maintained – and in the unlikely event of a breakdown we have plenty of stock and will have replacement roller delivered in no time. A roller is made up of carefully put together piles of nuts, bolts and other bits and pieces. From time to time you may have a problem with your roller. Just call the branch you hired from and a real live person will help. Low Hour, Serviced Roller Hire; All our rollers are maintained to manufacturer requirements – and all necessary PRA and Maintenance paperwork to ensure the smooth running of your job-site and operator safety is provided. NO “Environment” Charges or Miscellaneous bits and pieces at the end of the hire that turn a low quoted roller hire rate into a big invoice. Fuel: We hire the roller full of fuel -and charge for whatever you use. Delivery and Pickup: Unless we’re late – then the delivery is free. Operators: All our roller hire is on a “Dry Hire” basis with no operator. Cleaning: Well the first 5 minutes we cover but as our rollers are not designed to roll mud any cleaning beyond a 5 minute blast with a pressure cleaner will be charged. Damage to Water System: Our hire rollers aren’t designed to roll mud – and doing so means mud collects where it shouldn’t and tears off the water system. The repair cost will be charged. Since 1986 we’ve been providing roller hire to some of Melbourne’s biggest infrastructure jobs. We’ve developed a wealth of experience – and a great team with the skills and attitude to make your job easy. On Time Delivery. Guaranteed. Our “On Time Or Delivery is Free” Guarantee leaves the risk of a late delivery with us. Our fleet of delivery trucks do the vast majority of our deliveries so you know it’ll be delivered on-time by someone who cares. All our rollers are maintained to manufacturer requirements and all necessary paperwork to ensure the smooth running of your job site and operator safety is provided. 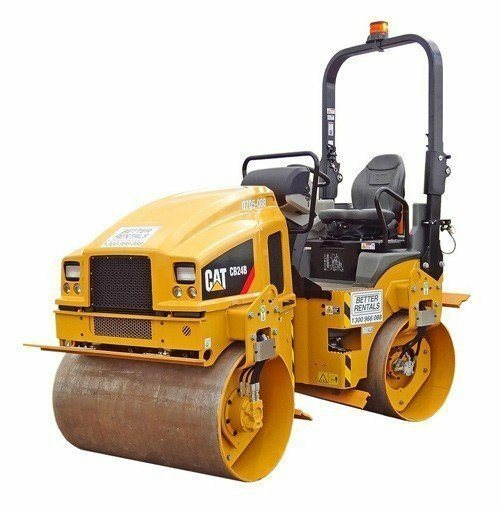 Caterpillar CB24B rollers is most of our 3 tonne class roller fleet. Quality rollers backed by the service and experience of Better Rentals.